This recipe comes to us from Nigella’s latest behemoth cookbook “Kitchen: Recipes from the Heart of the Home,” which I will be reviewing in short order so stay tuned. In the meantime, though, this was one of the first recipes I marked after leafing through the book at a galloping pace. I leave for work so early during the week I don’t get to have breakfast with my son so I try to make him something special for breakfast on the weekends. On this particular weekend, my son was boycotting any and all fruits so I decided to sneak some bananas into his diet by way of these muffins. He’s not much of a chocolate fan, so I was taking a risk. begging to be served as a dessert alongside coffee after dinner but I’m not sure I agree. They are a nice treat for breakfast, but rather pedestrian for dessert, unless you add white or dark chocolate chips, which I must admit I was considering. Substitutions: None, but like I say above, I will add dark or white chocolate chips next time. Would I make these again: Yes, I would, because they were easy to make and lo and behold my son actually ate these without making a face or spitting out his first mouthful. Grade: Three stars out of five. Were these yummy? Yes. Easy? Double yes. And they stayed moist at the end of the first day, two days later, and eve after I pulled them out of the freezer. But they were lacking a certain je ne sais quoi. If these didn’t appear in Nigella’s latest book, I’m not sure I would have tried making them. Good morning Mary! I love chocolate and banana together. These look wonderful! I make a great chocolate chip banana bread and these would have a very similar flavour so I know they’re delicious. 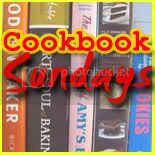 Thank you so much for linking up to Cookbook Sundays. Enjoy your day! Love your honest review, that makes for great reading, on your blog! Thanks. Thanks Melynda, more than anything I try to write well! Appreciate both your comments!